Years. I thought I’d have years and years to enjoy the always smiling, extraordinary talented new member of our Cardinal family. I am heartbroken. On a warm spring day in May, Twitter almost blew up with Card fans spreading the news. Rumors were flying that Oscar was called up. At last! Finally! 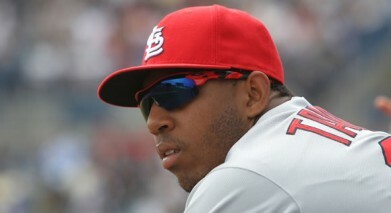 Our most anticipated Baby Bird since Pujols, was coming home to Busch. I distinctly remember the excitement of his first game in the majors. That magical, smooth, long, but lightning quick swing. A homerun that made Busch shake. All of us proud. A well deserved curtain call. The first of many, we assumed. He had us. He was ours. Bookmarked remarkably by his pinch hit homer in the NLCS to help keep our post season alive. Another curtain call. That huge smile. So glad we had no idea it would be his last. That amazing final catch he made, moving quickly in the outfield, beating out Jay. Working to show us that he was no defensive deficit. I want to see more. Not enough. Not nearly enough. He wasn’t given enough time. Not even close to enough. I’m sad. I’m angry. Why was this exuberant, polite, full of life with an unlimited future 22 year old kid taken? Taken away from his loving, proud family. Their loss is unspeakable. Taken from his friends, his fellow Cardinals, his native and adopted countries. His Cardinal family, and that of course, includes all of us. His untold number of fans, young and old. We all are simply heart broken. I’m nostalgic for what little we saw and all that will never be. God speed, OT. May you and your lovely girlfriend go with the angels. May both your grieving families find solace and comfort in the love from all of Cardinal Nation. I grieve for your family and for us. For all the games, all the curtain calls, all the years we won’t have you. You will remain forever young, forever smiling, forever a Cardinal.